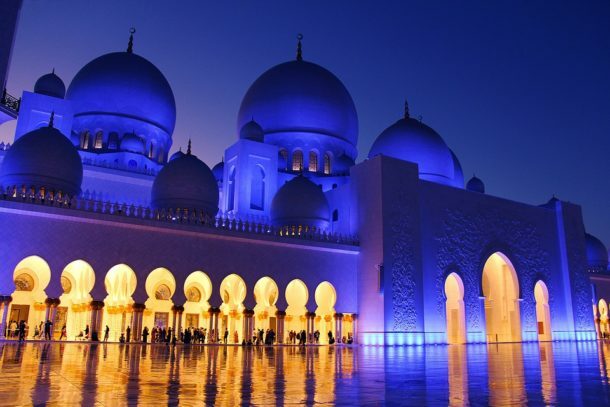 Couples considering getting married in Abu Dhabi can choose from a variety of unique venues. Opulent resorts with private beaches welcome wedding parties with deluxe accommodations, relaxing leisure activities and multiple sites to hold all of your wedding events. Or, select a modern palace designed in the style of traditional Arabian palaces with ballrooms of gold and marble and hundreds of picturesque domes. Such wedding venues in Abu Dhabi are sought out by celebrities and even house whole wings that are reserved exclusively for visiting royalty. Treat your Abu Dhabi wedding guests to sightseeing excursions between events. Perhaps they would enjoy a day of visiting the city’s museums, the Grand Mosque, or the Abu Dhabi Heritage Village. Art and history lovers alike will find opportunities to explore ancient antiques and modern works of art, while shopping enthusiasts visit some of the world’s most exclusive boutiques. You can even visit one of the world’s most exciting water parks, the fastest roller coaster in the world and an indoor adventure dedicated to all things Ferrari! Your Abu Dhabi wedding package comes complete with something for everyone on your guest list to enjoy. During your wedding planning, we can assist you with incorporating the local flavors and cuisine into your menus, while honoring both your personal taste and any special dietary considerations you and your loved ones may have. We are experts at executing complex international events for clients from a wide variety of backgrounds and can help ease your stress while addressing the many details when planning your wedding in Abu Dhabi.